To me, the happiness of Hawn State Park lies completely in its pure variety of ways to enjoy it. Are you a rock lover? Visit Hawn to see one of Missouri's best examples of Lamotte Sandstone, an old, coarse-grained sandstone that overlies ancient igneous bedrock. Think Missouri State Parks should be "for the birds"? Well this location sees a great variety of our fine feathered friends, including pine warblers, chickadees, and short eared owls. Love the gentle gurgling of a crystal clear stream? You have to check out Pickle Creek, which has been designated an outstanding state water source due to its crystal clear waters, due in part to that Lamotte Sandstone above. Water lovers may also seek out the River Aux Vases, which meanders through the area, carving out steep valleys. Then there are us hikers, and we're in for a particular treat as Hawn State Park presents us with four fantastic trails each of varying length and difficulty: the super short .70 mile Pickle Creek Trail, the 300 foot handicapped accessible Overlook Trail, the 9.75 mile Whispering Pines Trail, and the shorter 3.75 mile White Oaks Trail. Each of these well maintained trails allows us to take in all that Hawn has to offer including two backpacking camps on the Whispering Pines Trail for those who wish to take in the "wild" local nightlife, and that makes me happy! This is the second time I've hiked the White Oaks Trail in Hawn State Park, once in the fall of 2013 with my family and now the summer of 2014 with only my four-legged hiking buddy Hyatt, and I enjoyed every step of each journey. As if the changing seasons couldn't possibly provide enough change and variety, the White Oaks Trail itself constantly changes scenery and trail conditions as you hike. Like a Hollywood star vying for your attention, this hike seems to constantly attempt to outdo itself searching for new, fresh looks to give you. I'll start at the very beginning, because it is one of the most important parts of the trail to me, the trailhead. At the clearly marked White Oak trailhead I found a very well stocked information area, which offered literature on other Missouri State Parks, many area maps, a billboard with important informational postings, a very convenient vault toilet, and, on my summer trip, an absence of cars! It appeared as though I may have one of Missouri's prettiest State Parks, all to myself (well not completely myself I did share a bit with my canine companion). Just past the trailhead the White Oak Trail itself starts out a bit "rugged", featuring stones intertwined with rich, earthy roots comprising the first bit of surface. I found myself looking down frequently, to assure my footing along thefirst half mile of the trail due to the rocks and roots, despite theelevation changing very, very little, I'm always a bit overly cautiouswhen hiking alone to not twist an ankle. 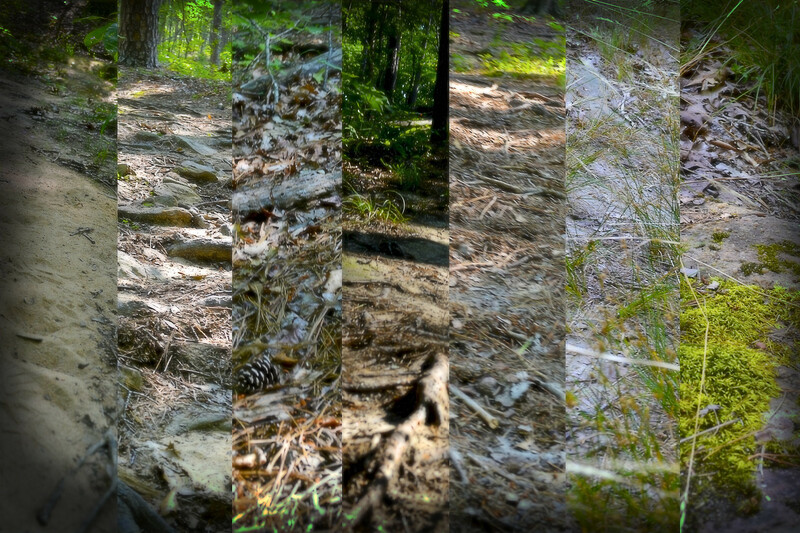 Continuing down the trail as you approach the first White Connector (WC1, which will lead you to the Whispering Pines Trail), the rocks and roots make way and the trail itself morphs into to a landlocked sandy beach-like trail, bordered by beautiful trees and undergrowth. As you continue to hike, past WC1, the sand particles become progressively larger and larger until they are no longer grains of sand but pebbles and small rocks. Then I catch oneof my very favorite scents, pine, and the trail changes yet again, thescattered shortleaf pine needles cushioning my every step as I silentlystride the trail's well worn path through majestic native shortleaf pines and cedars. It is here, among the piney giants, that I let a bit of nature's chorus swell around me, listening as the bird's tenor song crescendos, while rhythmic crickets keep measure. The only thing more amazing than the shifting scenery is that I have traveled only a mile to see it all! 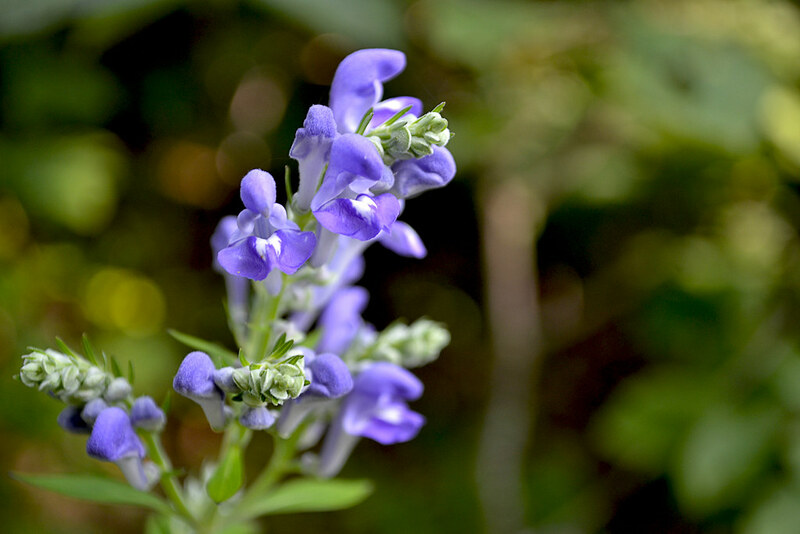 Skullcap, it may sound scary it's actually quite beautiful. Continuing down the trail you will find the second White Connector (WC2: which also leads to the Whispering Pines Trial), you'll want to continue to the right to stay on the White Oaks Trail. In just a few yards from WC2, you will find the official White Oaks Trail loop. 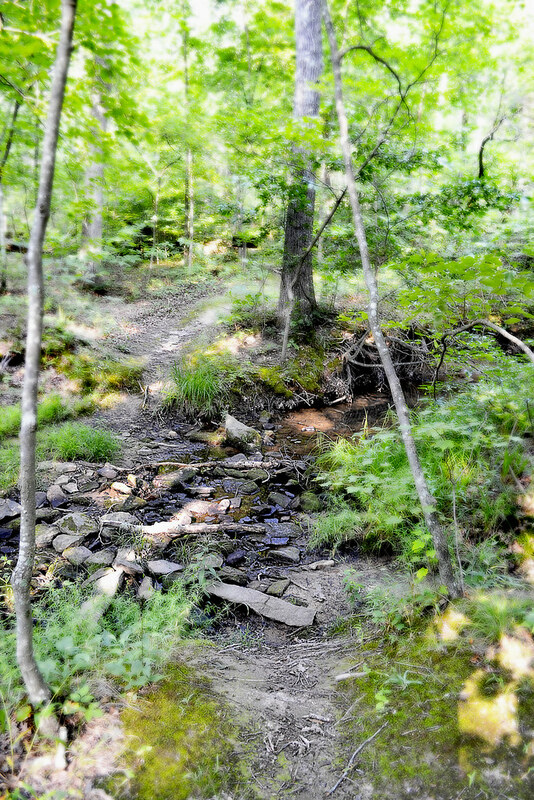 The White Oaks Trail loop will continue your journey through ever changing surroundings featuring some creek crossings, rock overlooks, boulders on which to scramble and maybe even some sweet edibles such as wild blackberries, hiding in the underbrush. Also be sure to keep an eye out for some truly stunning wildflowers such as the wild yellow lady-slippers orchid (which I couldn't spy anywhere). But if you are lucky enough to find one of the yellow lady-slippers orchids, don't try to take it home, the orchid's roots are actually attached to fungal threads deep beneath the soil and once those threads are severed the orchid dies... plus you could net a $1,000 fine or win a fabulous stay in one of our finest concrete incarceration centers for digging them up as well (so I'd suggest taking lots of pictures instead, and maybe even sending some to us here). 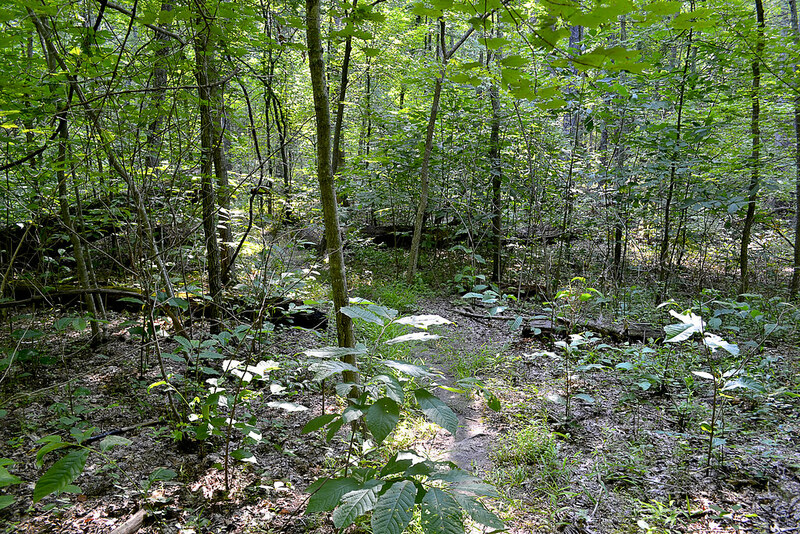 With so much to see and do along the way, the White Oaks Trail is a great solo or family hiking destination. There are a plethora of opportunities to splash about in a creek, take a side "off-trail" adventure into the underbrush to forage, climb the branches of a gnarled old cedar tree, bound from boulder to boulder, perch upon rock ledges, and so much more that the 3.75 mile length may never even be noticed by most, resulting in less of the dreaded "are we there yet's". This trail is truly diverse, overwhelmingly beautiful and simply begging for you to enjoy. As always, thank you for reading and Happy Trails! Below is a little something new I'm trying, Google's My Tracks. Hopefully you'll be able to garner at least a bit of information from the trail map below. Although the mileage at the White Oaks Trailhead stakes out the trail at 3.75 miles, My Tracks placed the mileage at 4.09 miles, maybe I took a bit of a wider trail than they measured, or perhaps my phone's GPS was off by a few feet here and there. I just hope you find the information below helpful and if you do, please let me know.